Omar Zakhilwal, finance minister of Afghanistan said the nation’s economy will benefit enormously from business presence of the Asian giants. Zakhilwal was addressing a news briefing in Geneva. This would buoy its economy after NATO troops withdraw in 2014, the country’s finance minister said. 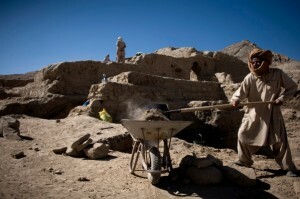 A group of Indian companies which in 2011 won rights to mine iron-ore in Bamiyan, in central Afghanistan, should invest $10 billion to $13 billion, and Chinese firms should commit $5 billion to $7 billion on the Aynak copper deposit in Logar province, Zakhilwal said. Afghanistan’s GDP should grow 10 per cent this year, in line with the 10-12 per cent annual expansion over the past decade, and expand by 6 per cent next year, Zakhilwal said. China National Petroleum Corporation has started oil production in Afghanistan and should invest from $1 billion to $1.5 billion, Zakhilwal said.